76000 spectators in Berlin’s Olympic stadium held their breath in the 81st minute as the Hungarian midfielder broke the deadlock between his Eintracht Frankfurt and VfL Bochum with a stunning free kick. 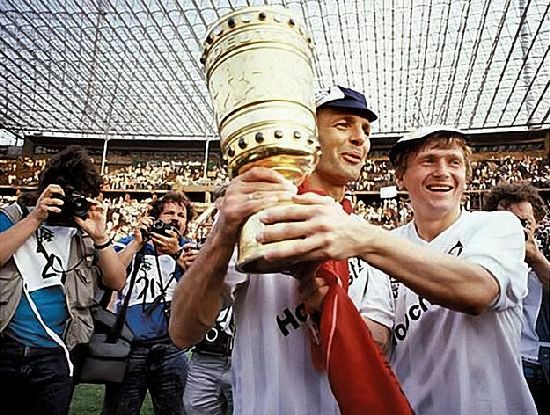 It would prove to be all Frankfurt needed to lift the cup. 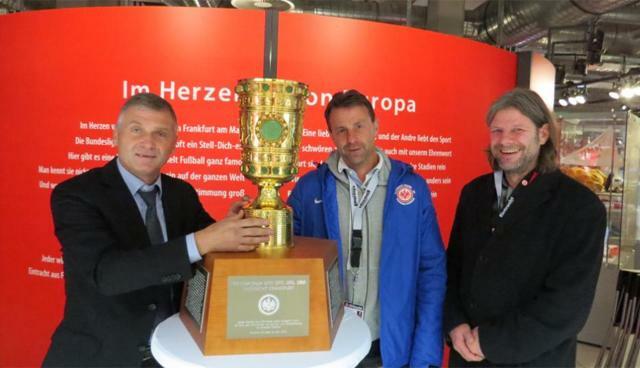 Lifting the cup with teammate and current Eintracht football academy director Karl-Heinz Körbel. That famous free kick, which won the cup against Bochum! From the perspective of 2016, where even the casual fan can watch multiple games in HD quality on multiple devices from Singapore to Los Angeles, it seems inconceivable that fans of Lajos Détári, “the last Hungarian star” were seeing him play in the Bundesliga for the first time on television on that late May afternoon in 1988, as per a special broadcast by the Hungarian TV channel. It would be another 10 years, with the lauch of Sport TV that Hungarian fans would be able to follow world soccer on a week to week basis. Fans of the Bundesliga, both young and old – given that we are talking about a player who played 33 games in the league 28-29 years ago – can rightfully ask the question: Just who was Lajos Détári? If you ask Hungarians (full disclosure – the author of this article grew up in Hungary and has heard more than his fair share of Détári stories), Détári is the last in line of the “Magical Magyars” – a lineage that began with early 20th century legends such as Imre Schlosser and the MTK teams of Jimmy Hogan through the 1938 World Cup runner up team, culminating in the famous Aranycsapat of the 1950s. Always measured against the FC Barcelona of the 1950s Golden Team, the later teams and players, such as 1966 Ballon d’Or winner Flórian Albert, or the late 1970s stars of Újpest and FTC, András Törőcsik and Tibor Nyilasi, or our protagonist Détári, were always burdened with the baggage of never possibly ever being able to live up to those lofty standards. He was nicknamed “Döme” after a fictional bear from the 1950s children’s magazine which you can find at http://dormogodomotor.hu/. The name “Dörmögő Dömötör” is an alliteration that can be translated as a Grumbling/Whining Demeter. Détári credits a girl from the neighbourhood for giving him the nickname on the account of his frequent grumbling. (link in Hungarian). Growing up in the working-class neighbourhood of Kispest, the family moved to a more central location in the 7th district with his parents (both transportation company employees). Perfecting his game on the asphalt of inner city courts – save for a brief 9 month love affair with table tennis at the age of 14, when he stopped going to practices altogether! – Détári lived and breathed soccer and Honvéd, where he made his professional debut in 1980 at the age of 17. The technically gifted central midfielder Détári was groomed under the tutelage of “the Nation’s Bomber” Lajos Tichy, the man who was incredibly left out of the Aranycsapat, despite going on to score 51 goals in 72 appearances for Hungary. Under another former Honvéd legend in coach Tichy, Détári was quickly proclaimed the last rightful heir to the throne of all-time Honvéd legend Puskás after scoring 72 goals in 134 games before his 24th birthday. Tichy would be replaced by his teammate and friend Imre Komora in 1982, which would have disastrous consequences for Détári in the long run. For the time being it was the former Honvéd midfielder (64 goals in 277 matches) turned national team manager (in 1986), whose attitude and demeanor Détári likens to Sir Alex Ferguson, that was calling the shots. He would be calling the shots in more ways than one, as Döme met Komora’s daughter Andrea at a dance event in November of 1982 and got married to her in June of 1985. The relationships between player and coach, son-in-law and father-in-law had become increasingly complicated, as there were rumors that Détári began to get increasingly involved in the Budapest nightlife. Still, he made the team for the World Cup in Mexico that infamously got humiliated 6-0 by the USSR (thankfully the author has no memories of this on the account of being 3 years old at the time) despite beating the mighty Brazil 3-0 earlier that year, with Détári opening the scoring in the 5th minute. In what would prove to be the last WC match (30 years and counting! ), Döme scored the last goal for Hungary in a 2-0 triumph over Canada.So, that’s where things stood with Döme in the spring of 1987. Courted by Terry Venables’ FC Barcelona – who just sold Diego Maradona to Napoli 2 season ago and picked up legends like Andoni Zubizarreta, Gary Lineker and Mark Hughes were looking for another attacking midfielder behind Bernd Schuster. After initially offering 2 million USD over the phone, former FC Barcelona president (2000-2003), then the vice president modified his offer to 1 million for a year with an option for an extension, after their representatives saw Détári put in a lackluster performance in the meaningless season finale against Debrecen. Venables would go on to coach Détári in the same year as part of a World XI, with the Englishman telling the Hungarian how much he regretted the decision. The deal with Barcelona fell through and it was Eintracht Frankfurt that beat out AS Monaco for the Hungarian playmaker’s signature to the tune of 3.5 million German Marks. For a kid from the less than romantic concrete jungle of Kispest, who was making a measly 4000 Hungarian Forints -the present day equivalent of 90 dollars per month -this was life changing money. Eintracht, founding members of the Bundesliga were a 2nd half of the table tea, but despite losing stalwart defender Thomas Berthold (62 caps) and defensive midfielder Ralf Falkenmayer over the summer, the Eagles had a decent squad, picking up defender Dietmar Roth (264 matches played for the club) and featuring goalkeeper Uli Stein (6 appearances for West Germany), defenders Uwe Bindewald (who would go on to make over 400 appearances for the club) and Karl-Heinz Körbel (a whopping 720 games), sweeper Manfred Binz (14 caps), 20-year-old midfielder Andy Möller (85 appearances for die Nationalelf ), and Polish striker Włodzimierz Smolarek (60 caps). Adding, the promising 24-year-old playmaker was a great opportunity to solidify their squad, as they finished the campaign in 9th place. Speculations (Juventus were rumored to be interested in signing him), as to where to go next and what happened to the 18 million German marks, or 12 million USD according to this website, (remember, the average monthly net income was 7000 HUF or 145$ in 1988) were rampant, and it did not help matters that Komora took over as Olympiakos manager in 1989. The ending, as it often is, was rather fast and unspectacular. He arrived in Italy “in a white Porsche with a cashmere scarf” and played 3 season for minnows Ancona and Bologna, but was now 30 years old. Stints in Switzerland, Austria, interspersed with 13 games for Ferencváros culminated in his 1999 retirement for BVSC. Since then, he has coached a whopping 19 teams from Vietnam to Greece, as well as 10 Hungarian teams, with his 2011-12 Ferencváros being his most notable one. In 2014, Frankfurt invited him to their game against Gladbach in the German Cup, and Détári was promptly given a standing ovation. Despite admitting to and recovering from alcoholism, Détári ultimately remains a divisive figure in Hungary, both recognized for being the last of the colossal talents that Hungary has had, but more so for the equally colossal waste that his career ultimately had been. When in 2013, a Hungarian publishing house organized a booklaunch for their book about Détári, Döme, as only he can do, failed to appear….